Lena successfully fled Portland to join the Wilds and avoid the procedure, but it costs her everything. She roams the Wilds alone, waiting for Death to take her and bring her back to Alex, but those plans will have to wait because a black haired girl comes to her rescue, nursing her back to health and teaching her the ropes of living on the outside. Nothing is easy in this harsh lifestyle and many challenges awaits Lena along the way. I have mixed feelings about Pandemonium, not because it wasn’t good, but because I was extremely disappointed. Let me explain, and I’m sorry but I can’t without a tiny spoiler. You can skip the first paragraph if you are highly allergic to spoilers =) I don’t know if you’re like me, but after I finished reading Delirium all I wanted, is to know what happened to Alex, for him to survive and to rock it in Pandemonium. I’ve anxiously awaited a year for my Alex fix and I didn’t get it! He is not really part of the book, he is pretty much memories, conscience and hallucinations and it really let me down. I was flowing from pages to pages hoping the next one would be the one Alex got back in the game and was left on my appetite. Now onto the book itself, I thought it was good and up to par with the previous novel. The form of the book was somewhat unusual but it worked just fine. Lauren chose to alternate chapters between Now and Then instead of narrating the story linearly. I thought it made things interesting but I kind of missed how she got from Then to Now. See, Then is her time in the Wilds, recovering from her escape, learning her new lifestyle, facing challenges as a invalid and Now is Lena living undercover in Manhattan working for the revolution. I have an idea of the catalyst for this new mission, but the exact why and how are vague and I kind of needed that. The alternating chapters added to the tension because once you finish a chapter, the following one isn’t the one that will clench your thirst, and it urges you to read faster to know what happens next and I thought it was a smart move. Oliver’s writing style is also a delight that you don’t want to miss. Highly suspenseful, the plot itself was satisfying. I preferred the Now over Then, but Then was necessary to understand Lena’s path. Not everyone in Lena’s new life are who they seem and sometimes she will misjudge them and their motivations, putting her in arms way. I truly enjoyed the journey Oliver set Lena on as she matured a great deal in this novel, promising a very interesting third novel. This installment is filled with new characters and they were all great even though I wasn’t fond of all of them. Tack, one of the invalids, isn’t really approachable from the start, but he really grew on me. I didn’t really like Raven, another invalid, but she played a big role in Lena’s evolution so I’m glad she was there. Justin, the son of the leader of Deliria-Free America, turned out to be an interesting surprise and even though, for me, he palled in comparison to Alex, he was a good enough character, showing strength and determination when the situation was desperate. Remember how Delirium’s end was a killer? Well Pandemonium is just as bad, or might be even worst. Honestly, after reading the last word I hated Lauren Oliver, and if you’ve read the book, you know what I’m talking about. I had to vent my frustration to my poor innocent hubby who thought the whole thing was funny- NOT! Lauren how can you be so cruel? how? Waiting another year is torture, plain and simple. I want to get my hands on Requiem NOW! I strongly recommend this series, it’s a very original dystopian tale in which Love is a disease to be eradicated at all cost. For your own sanity though, you might wanna wait until all three books are out, because I’m honestly pulling my hair out here. Have you read Pandemonium? What did you think of the end? Omg, I just finished this one two nights ago and I feel what you mean! Every single thing you pointed out was exactly how I felt. 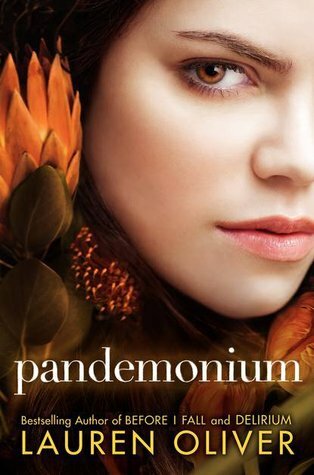 I wanted to love Pandemonium - and I do - just...not as much as I love Delirium! Also, the thing about Alex - TOTALLY me too! I wanted more of him! Every time I turned a page, I wanted him there and very present but...it didn't happen. Amazing and thorough review! Loved it! Glad to see I'm not the only one feeling this way! I had a feeling the book would end that way....I mean, she couldn't not end it that way, ya know? But I feel your pain! I enjoyed the flip between Then and Now; it played out in my head like movie flashbacks...or flashforwads. I thought she did it well. Although it was a completely different style from the first book. Are you talking about the woman who arrested her? I'm currently reading this one .. I've actually 30 pages left to read but I'm a bit disappointed to be honest! I'm hoping the last pages will be as awesome as the ending of Delirium :) !! You come back and update me when you're done! Book but it didnt affect me the same way the Delirium did. Im a little disappointed but it was still good. I totally agree with you on Julian, he was nice but i just didnt see him the way i saw Alex and i feel like the relationship went super fast. all of a sudden she was in love with him. But w.e. i cant wait for Requim!! i have to find out how this ends!!! ahhhhh Im so excited A whole year is gona be absolute torture! Thanks for the review loved it! Thanks =) Glad you enjoyed it!